Sour cherry season has just ended here in BC and those plump, sweet, dark cherries from the Okanagan are almost gone from our local markets. But there is a way to preserve all that cherry goodness. Freezing is a no-brainer and requires just a bit of time and patience. A cherry pitter is also a nice accessory and I’ve thankfully inherited one from my husband’s grandmother. It looks odd-ball but it does the trick, and so apparently, does a paper clip. Wish I had known about cherry pitters when I made this buttermilk cherry sherbet a couple years ago! Macerating cherries is a perfect way to preserve this fleeting taste of summer. One way is to add cherries to a jam jar, top with booze (vodka, brandy and whiskey are all fine choices – but a cherry liqueur like Luxardo is another fantastic option) and let it sit for a week or more. Your Manhattans will thank you. 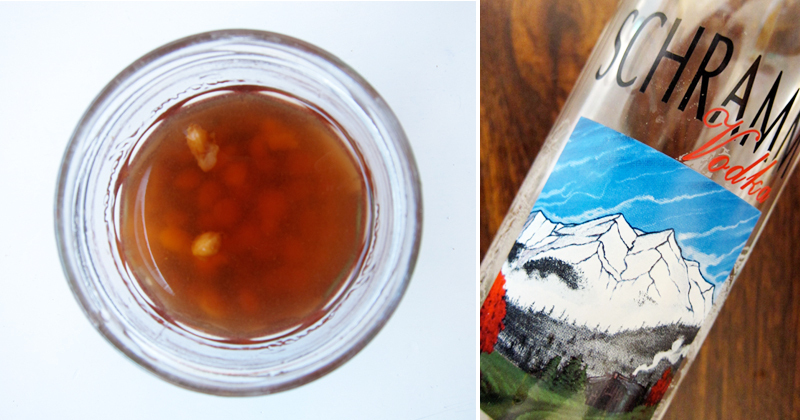 Freezing and pickling via alcohol are all excellent options, but when I spotted this cherry conserve by Jennifer Perillo, I was intrigued. The recipe starts off by mixing cherries and sugar along with orange zest and almond extract and letting it sit overnight. The next day it cooks up enough to call it a conserve. I’m sure it’s delicious – in fact, I know it is as it’s pretty much how I’ve made cherry compotes in the past. But I liked the idea of macerating the cherries in the sugar & flavourings without adding heat. I wanted cherries that screamed freshness. And they did. They screamed freshness and flavour so loud that the jar was half empty before I realized that they were nearly gone. 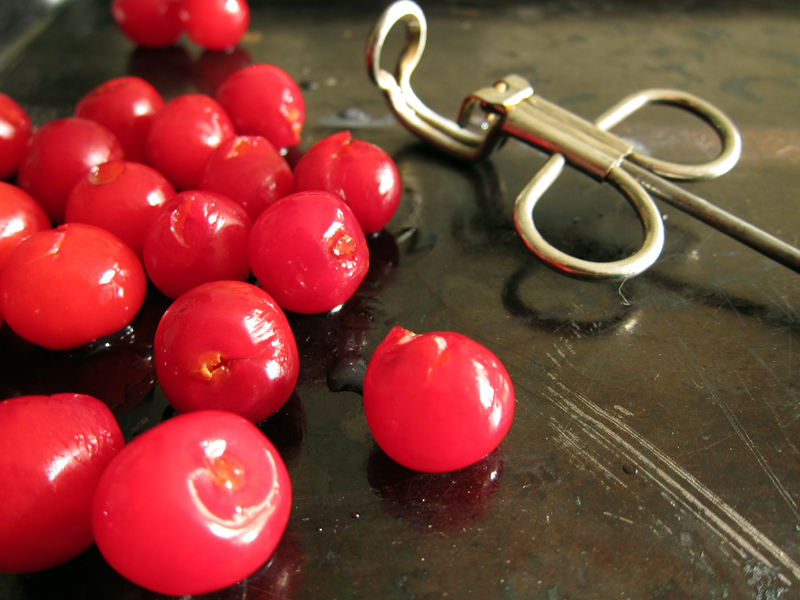 The lime zest and almond extract intensified the cherry flavour and eating each ruby red orb was like a ka-pow! right to my quivering taste buds. They were incredible! The remaining jar spilled over my morning pancakes and it made a very bright start to the day. I can only imagine how fantastic they’d be poured over ice cream or placed on a skewer and popped into a whiskey sour. I will be making these again (in fact, I have a batch sitting on the counter right this moment) and I will give this cherry slush a try too. The macerated cherry recipe you’ll find below, but first I wanted to give a recipe for something a bit more unusual. After pitting pound after pound of cherries, I figured there had to be a better way than tossing them in the garbage. Thanks to a tip on Twitter, I used many of the remaining pits as a drainage base for a potted plant! Clever, no? But maybe not as clever as this cherry pit vodka. It couldn’t be easier. Pits + vodka = the heaven scent flavour of almonds. True, there is a teeny-tiny smidge of cyanide found in the pits, however, the amount is so small that I think we’re all safe for a sip or three. If you are still intrigued about what else you can do with your leftover cherry pits, this cherry pit ice cream sounds delicious. There’s no real recipe for this beverage. Add cherry pits into a tightly lidded jar. Top with vodka. Let wait at least a week. Strain and use in your favorite cocktail. Cheers! If you are using sour cherries, keep the cherries whole. If you are using Bing or a larger cherry, cut the cherries in half. Add all ingredients to a glass jar and give everything a good stir. Screw on lid and let sit over night on the counter. The next day give the jar a shake and pluck out a cherry. Let your eyes roll back. Repeat. The jar should last a couple weeks in the fridge, but I doubt you’ll have any left that long. I’ve never dabbled with cherry pits, but there was a cherry pit panna cotta recipe in Andrea Reusing’s new “Cooking In The Moment” that I kept on coming back to. I chickened out in the end, tossing my pits in the trash, but seeing this second use of them makes me want to hunt down more of the stone fruit. I love the idea of using the cherry pits to infuse almond flavor into something and these macerated cherries look so good! And cherry slush? Yum. It was so sad to hear about Jennie’s husband yesterday. I hope she is finding new strength with each day. Oh, my. I think I’ll head to the market this afternoon for cherries. 3) drained/cleaned cherry pits from vodka recipe used to hold down a bottom crust in a pie recipe. This sounds like a great way to have summer year-round. I’m going to need these during our first snowstorm…I can feel it. Nicole, I felt the same way. I had this post scheduled before I had even heard the news and was absolutely heartbroken about it. Yes, get there soon Crystal! Can’t miss out on all that cherry goodness. Kate, I love the idea of using the pits to hold down a pie crust. And I know from experience that tossing in a few boozy cherries into a cherry pie makes it taste even better! I LOVE CHERRIES! Now I wish I wasn’t so lazy and got in contact with that Sour Cherry guy and got some sour cherries. I even have a pitter! Next year for sure. Thanks for sharing all these great cherry recipes and tips. they look gorgeous i love them with the pancakes/pikelets! Cherry pits?! Really? This is great…I actually have a bunch of sour cherries frozen, so this may be in my near future. And yes, that cherry pit ice cream does sound pretty darn good. Thanks for the inspiration! I’ll take the macerated cherries any day. What a great idea for having them on hand in the winter months. Love cherries! And I have an olive/cherry pitter too which I have barely used in the 2 or so years I’ve had it. Time to use it! Hag, you should have! He had lots this year and they were so good. 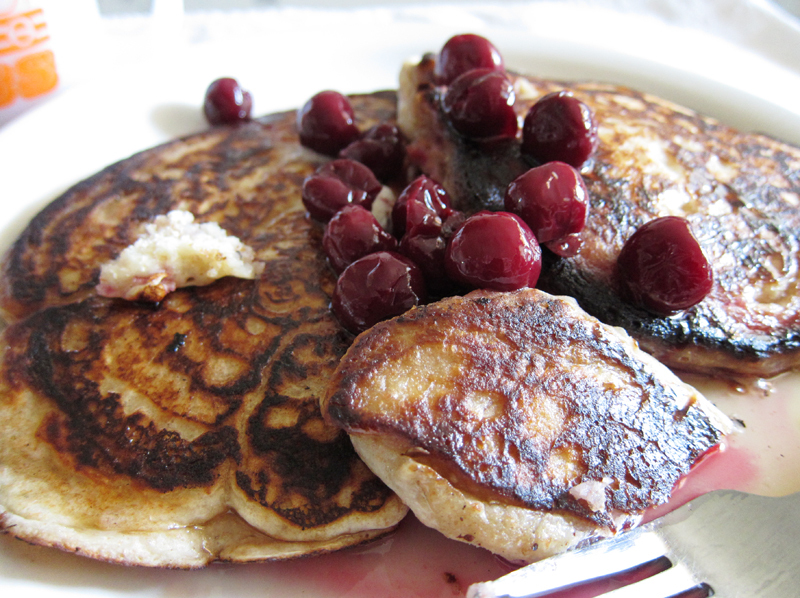 You can still make these recipes using Bing cherries! Try the vodka – it’s pretty amazing. Bijoux, are there still cherries out there where you are? Still lots here but I imagine they’ll be gone soon. I didn’t come across a single sour cherry this year! Yours look sooo good! Thanks Jennifer, they were delicious!! Ooo cherry pit vodka!! Yum. I need to keep an eye out for sour cherries next year, I totally missed them this year. Hi there I live in Sydney Aus. 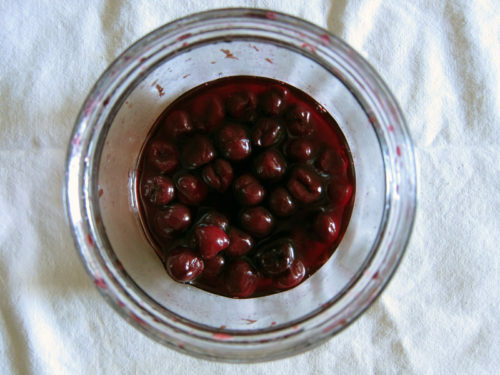 I came across your info on preserving cherries.THANKS….. I LOVED all the info on cherries etc. I have 6 kilos of them looking at me right now. Yummy. Heres a thought. I’ve been using Vodka for other fruit in the past.